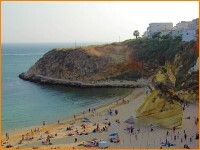 In history Albufeira was a thriving seaport and had its own castle, that was later destroyed in the earthquake of 1755. Happily, most of the older parts of the town that survived and have been carefully maintained. In Roman times it was know as Baltum and later changed by the Moors to Al-Buhera. During the Moors 8th Century occupation the town became an important trading port. In 1532 and in 1755 the town was badly hit by earthquakes, and in the latter, 227 unlucky people perished when the roof of the town church collapsed. During the "War of the Miguels" the town was besieged and set ablaze. The destroyed town consequently suffered a very long period of poverty and really only recovered with the boom of tourism in the later half of the 20th Century. As a result of the tide of tourism, this "once upon a time" fishing village has expanded since the 1960s into a major holiday resort and now has over 15,000 permanent residents. As the sun sets the centre of the town changes its character. 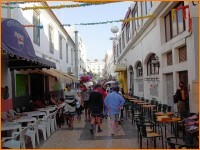 A plentiful collection of bars, restaurants and clubs start to fill-up with people, until they spill over into the narrow streets. 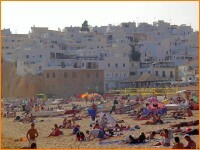 A fine selection of good beaches extend east and west from the town. Praia de Balaia, Praia de Castelo, Praia de Falésia, Praia de Galé, de Olhos d’Agua, Praia de Maria Luisa, and Praia de São Rafael, being the principal ones. There is a small museum of 15th and 17th century Ming ceramics and a Municipal art gallery that holds regular exhibitions during the season. A further addition to the town is a new Virtual Archaeological Museum. A new Marina has been completed on the west side of the town and offers a different and attractive aspect. Other places of interest near to Albufeira are, Armação de Pera, Boliqueime, Guia and Paderne with its ruined castle perched on an isolated hill some distance from the village. This castle was liberated from Moor occupation in 1248 by Dom Paulo Peres Correia. At Ponte Grande there are impressive caverns with large arches, and also the underwater caverns of Grutas do Xorino.